Amindo manufactures Antique Reproductions made of kiln dried, plantation-grown mahogany, the tru swietenia mahogany. Construction is exactly the same as that preferred by th e old master craftsman years ago. 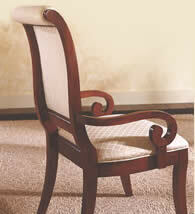 Each piece is made of solid mahogany. The joints are mortise and tenon or dovetail, and all carvings and finishings are meticulously done by hand. This exacting process is employed to ensure authenticity and to offer the best time-proven design and construction of this most prized furniture. We hope you enjoy our furniture, one of the finest reproductions ever made.